organisations to support local sustainable development and climate change mitigation activities on the ground. During the past 20 years, First Climate has developed more than 70 projects all around the world. In addition, First Climate advises companies on how to reduce their carbon footprint and helps them switch to renewable energy. First Climate also develops concepts for sustainable management of water resources as well as water replenishment projects in water-scarce areas of the world. First Climate is Ryanair’s partner for its voluntary carbon offset scheme. 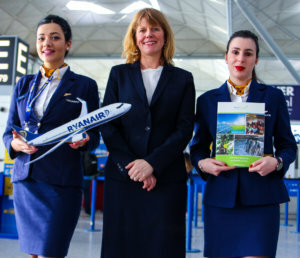 This program enables Ryanair passengers to donate to offset travel-related emissions when booking their flight with Ryanair. 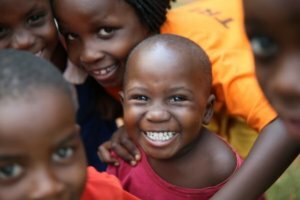 The funds are used to support a project in Uganda which distributes energy efficient cookstoves to households in the Kampala region. It does so by offering technical and financial support to manufacturers and by promoting the new stove technology to raise demand and awareness in the local community. To date, the project has enabled the commercialisation of more than 520,000 improved cookstoves. It has a major positive impact by contributing to climate change mitigation and improving the lives of local families. The improved stoves help families to significantly reduce their charcoal use. Besides saving on fuel costs, this helps to reduce greenhouse gas emissions and contributes to the conservation of native woodland in Uganda. Furthermore, the improved design of the stoves leads to much higher combustion temperatures which helps to reduce indoor air pollution. This prevents associated health problems like respiratory infections, cardiovascular and ocular diseases. “Without the voluntary commitment of the private sector, the aim of the Paris Agreement to keep global warming well below 2°C, is unattainable. We therefore highly welcome Ryanair’s and their passengers’ commitment to climate change mitigation and are very grateful for the support of our climate protection project in Uganda.